By sharing what they’re going through, these mommy bloggers have connected with other parents who are facing similar situations. Writing about their experiences has also helped them process the tremendous amount of information they’ve received about their children’s conditions, prognoses and treatment. “It’s definitely been a great way for me to wrap my head around what is going on with Bekah,” said Sarah Plant. Blogging has also made it possible to turn their children’s illnesses into something positive. “I knew there must be a reason for our baby to have spina bifida and this was God’s way for us to help others,” said Megan, who began blogging in April 2011, seven weeks before Jordan was born. For each child, the blogs have provided a great record of not only their medical journeys, but also their early years as they celebrate birthdays and holidays, a new tooth or learning their first words. All three moms encourage other parents who might be interested in blogging about their children’s medical condition to go for it. 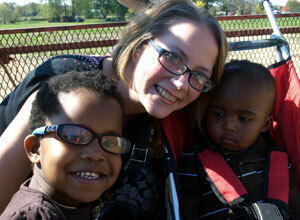 If you’d like to share your child’s medical journey, contact Akron Children’s PR staff at webmaster@chmca.org.